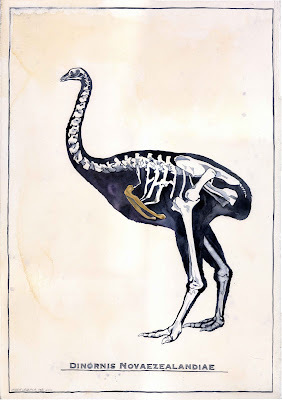 The special detail in this painting is the wishbone (which would be about 50cm tall on a Moa) - symbolically painted in gold, for hope and good wishes. You can bid on it here. If youre not in NZ or Australia, you may need to make up a New Zealand address to register on the site, but since I'm posting it directly, the winning bidder can give me their real address anywhere in the world. *The print 'We've Come A Long Way, Baby' for sale in London, see earlier posts, is in this series.